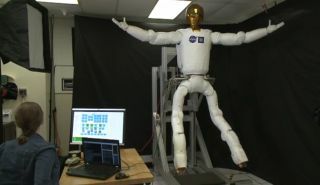 NASA's Robonaut 2 flexes its newly built legs in this still from a video demonstration of the robot's new capabilities released Dec. 9, 2013. NASA's robot butler for astronauts, Robonaut 2, may still be waiting for its legs to be delivered to the International Space Station, but you can see how the humanoid automaton may dance in weightlessness with an eerie elegance in this new video. The video waltz of NASA's Robonaut 2, set to the "The Blue Danube" by Johann Strauss, was created by SPACE.com by stitches together a series of NASA recordings of the droid's prehensile leg tests. This SPACE.com infographic gives an in-depth look at NASA's humanoid robot Robonaut 2, the Astronaut's Helper. See how NASA's Robonaut 2 works here. Since then, the R2 unit has been performing tests and experiments in a stationary position inside the space station, but it's expected to be able to move around alongside the astronauts after it gets its legs sometime this year. Though humanoid in form, Robonaut 2's legs move in some unnervingly inhuman ways. Instead of one knee, r2 has seven joints that bend in all different directions, and watching its legs move is almost like watching a horrible football injury in slow motion. When fully extended, the automaton's legs will span 9 feet (2.7 meters), according to NASA. And R2 doesn't have feet. Instead, it has special tools called "end effectors" that will allow it to use sockets and handrails to climb around inside and outside the station. NASA officials, however, have said that R2's upper body still needs some upgrades before it will be ready to venture into the vacuum of space. Last month, NASA unveiled its latest humanoid robot Valkyrie, or R5. The 6-foot, 2-inch tall (1.9 meters) robot, which has an uncanny resemblance to the Marvel superhero Iron Man, was built to compete in the recent DARPA Robotics Challenge for disaster-response robots in December.